Many people are on low sodium diets. Canned Vegetable Stocks can be very high in sodium. 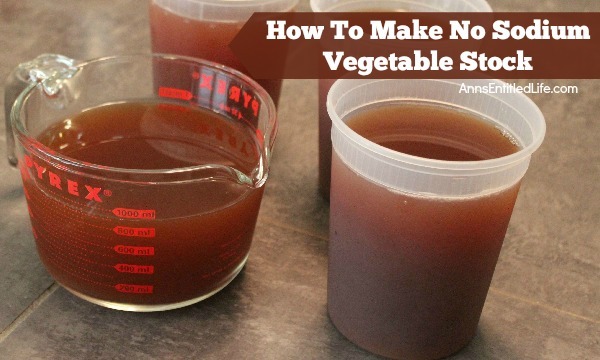 This easy recipe made with vegetable scraps and cast-offs is a great way to make no sodium vegetable stock! • As you cut, dice, chop fresh vegetables, take the scraps and place them in a gallon size bag in the freezer. 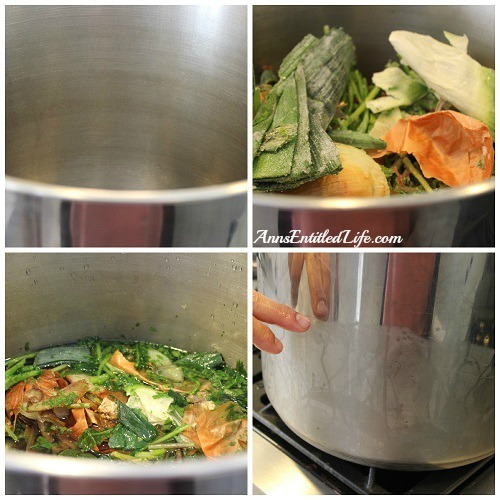 When you fill a bag or two, you are ready to make a no sodium vegetable stock. • In a large pot, add 12 cups of water per gallon sized freezer bag. • Add frozen vegetable scraps. • Make note on the outside of the pot with a ruler where the water level is, then add 12 more cups of water – you are going to reduce that water back down to 12 cups, so it is an important notation. • Bring to a boil, then reduce heat and allow to simmer for 4-6 hours or until half the liquid in the pot cooks off from your original mark. • After the water is reduced by half, remove the large vegetable pieces (these can be composted at this point). • Strain the leftover liquid through a colander. 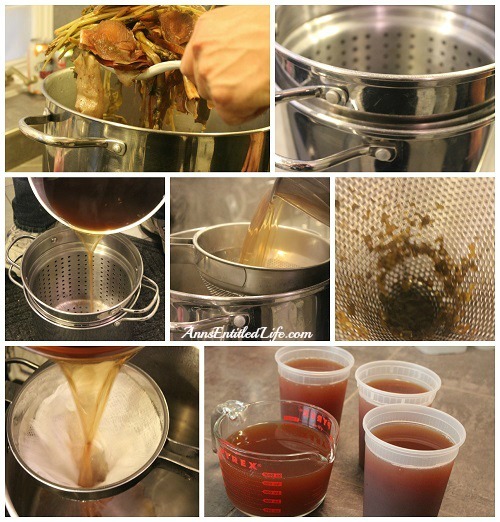 • Strain the colander liquid through a chinois or fine mesh strainer. • Strain again, this time lining the chinois or fine mesh with a cheese cloth. • Portion out strained No Sodium Vegetable Stock for freezing or immediate use. 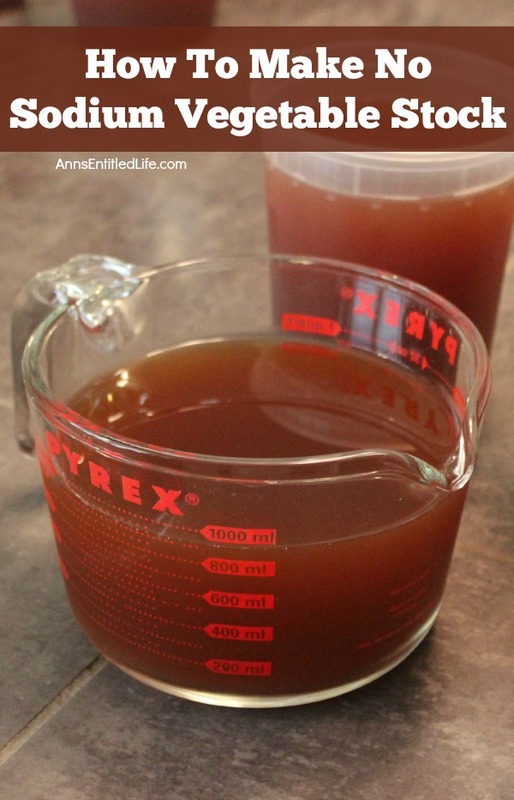 This recipe makes 12 cups of vegetable stock per full one gallon bag of vegetable scraps. Hubby always has a bag of vegetable scraps in the freeze. We just keep adding to it as he scrapes carrots, cores peppers, onion skins, etc. Just remember that your stock will take on the flavor of the vegetables, so don’t go too crazy with anything that has a very strong taste, or a lot of green. These days, Hubby generally uses a pressure cooker to make his No Sodium Vegetable Stock. It takes about an hour that way! I love to make stock! If I have to buy it though, I have been getting a new one by Swanson that is called unsalted and really pretty good. You are right Ann, I do believe it has a low amount, but it does still have some. But for Hubby and I, low is fine for an emergency stock. Thanks Shell! This is great! I’m going to pin it, and try it. It is so easy, Alissa! Well worth doing. Thanks so much I will be doing this very soon. Jay is is pretty darned easy. Hubby does this every time he gets two bags full of vegetable scraps, and just doubles the water, peppercorns, bay leaves and cook time. That’s how we operate here too, Renae. He just loooooove when I tell him to “hold” while cooking so I can take photographs! what a great idea. I can save scraps now that we finally bought a small freezer, I have room. I found you through the WW hop. How long does your Hubby pressure cook his stock? I can’t wait to try to do this!